Parent-Child Interaction Therapy (PCIT) is a manualized behavioral parent training program developed by Dr. Sheila Eyberg in the 1970s. Since its development over 40 years ago, research on PCIT has followed Kazdin’s model for treatment development, progressing from a conceptualization of the problem area and proposed mechanisms of change, to a formalization of the intervention, to outcome studies, and ending with testing the boundary limits of the intervention. PCIT is now recognized as an evidence-based treatment for young children with disruptive behavior disorders and/or a history of harsh physical discipline and child physical abuse, with increasing evidence to support its use for children of diverse cultural backgrounds and with varied presenting concerns. 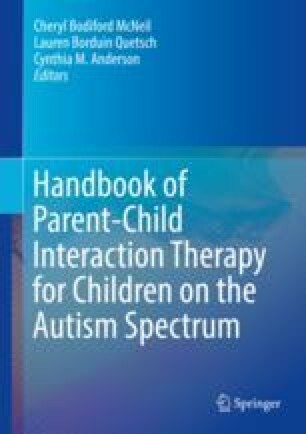 The current chapter reviews 40 years of research on PCIT, beginning with a summary of effectiveness and efficacy trials using standard PCIT, followed by descriptions of adaptation and applications of PCIT for children of diverse backgrounds and with a variety of presenting concerns.